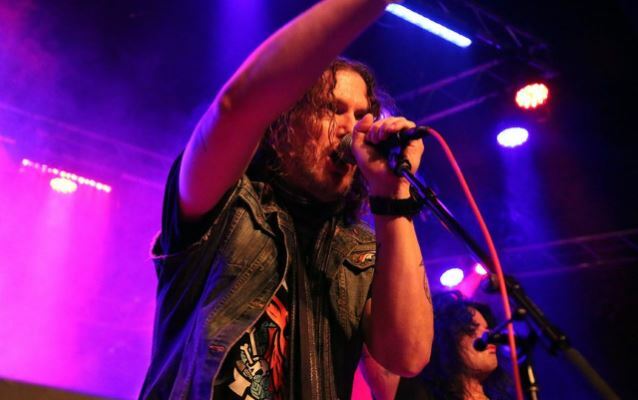 Joe Dolan of JoeDolanPR.com has uploaded video footage of HOOKERS & BLOW, the band featuring GUNS N' ROSES keyboardist Dizzy Reed and QUIET RIOT guitarist Alex Grossi, performing on September 5 at the Whisky A Go Go in West Hollywood, California. Check it out below. Joining Reed and Grossi at the Whisky show were W.A.S.P. and HOTEL DIABLO bassist Mike Duda and former ACE FREHLEY drummer Matt Starr. HOOKERS & BLOW hosted two residencies at Whisky A Go Go in Hollywood in 2013 with guest musicians that included members of MARILYN MANSON, THE CULT, QUIET RIOT, W.A.S.P., IGNITE, ALICE COOPER, T.S.O.L., ACE FREHLEY and more. Asked what his strongest memories are of the time when GUNS N' ROSES released "Use Your Illusion I" and "Use Your Illusion II" simultaneously in 1991 and they became the biggest rock band on the planet, Reed told The Maitland Mercury: "It was definitely a pinch-myself-every-once-in-a-while situation to see if I was dreaming. But it I had known them before they even got signed and Axl [Rose, GUNS N' ROSES lead singer] had talked about having me in the band from very early on and then to watch them become so gigantic, I was always wondering if it was really going to happen. But he's a man of his word and when they were ready to start tracking those songs and those albums he called me and I got a phone call a couple of days later from Del James who was putting together the press release and said, 'Congratulations, you're in GUNS N' ROSES.'" He continued: "When I joined the band, they were chartering this jet that we used to fly around on everywhere for those three years. So I toured with a major band for three years and one day I was sitting around with some of the guys in the crew and they were all telling bus stories — stories about things that happened on the [tour] bus. It got to me and they said, 'C'mon, Dizzy, what are some of your bus stories?' and I said, 'I've never been on a bus.' But, you know what? I've been on a shitload of buses since then. I prefer it these days — I like being on the bus and rolling down the highway."